The lowest level of radiation emissions per study. Your health and safety is our greatest concern. The new addition of this versatile 3D system to our diagnostic armamentarium provides us with cutting edge technology. You will see this “cutting edge technology” is evident throughout all aspects of our practice and it allows us to meet the full range of our patients imaging needs. In addition to the 3D images, this 3-dimensional system will also deliver crystal clear 2D panoramic radiographs (conventional x-rays), which still form the diagnostic foundation of most cases. These images enable us to provide a clear and more definitive diagnosis (especially with respect to implant restoration and facial reconstruction) and more accurately anticipate potential surgical sequela. 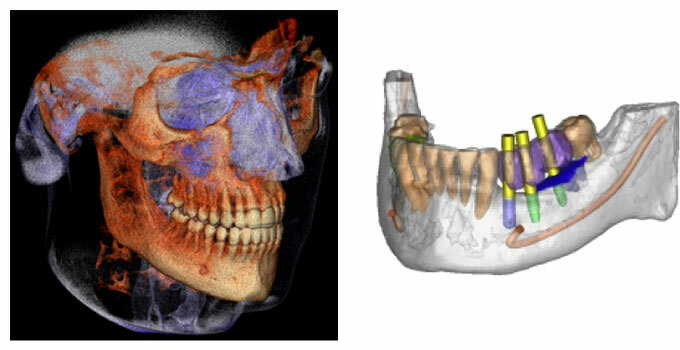 Because many cases require additional anatomical detail, the system’s multiple 3D imaging capabilities support a wide range of clinical applications with focused-field, single and dual jaw views. TMJ, sinus and maxillofacial views are easily obtainable. This state-of-the-art technology will help us diagnose with an enhanced level of accuracy and provide treatment with unprecedented confidence. Whether we are analyzing a complex tooth impaction, planning a multi-site implant case, or visualizing TMJ dysfunction, the precise, crystal-clear 3D and panoramic images will help us to formulate a specific treatment plan that will address your needs and answer any questions that you may have about your care and treatment options. This new addition to our diagnostic armamentarium provides us with cutting edge technology that enables us to provide a clear and more definitive diagnosis (especially with respect to implant restoration and facial reconstruction) and more accurately anticipate potential surgical sequel.